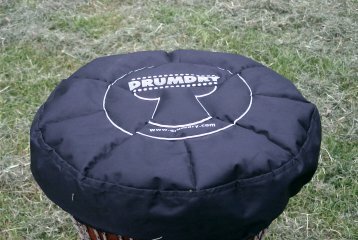 The revolutionary new drum cover that protects, tunes and conditions your drum skin. Within a week of covering your drum with a Drumdry cover or bag you will achieve a tuned sound without all the effort of conventional (backbreaking, hand blistering) tuning. When you purchase your drum (especially djembes from West Africa), the tone of the drum is crisp and 'in tune'. This is because they come from a climate that has a very low humidity. Sadly they do not stay in this condition for very long, as damp climates saturate the skin, making it stretch and giving the drum a baggy 'out of tune' sound. Of course the drum may be tuned by continuing with the Mali weave and banging down on the metal rings. There can however be a few problems with this method of tuning. There is generally only enough room for 3 or 4 revolutions around the drum before you reach the top and run out of room, preventing further tuning. When the skin is damp it is weak and tears easily. If the skin is nicked whilst hammering down the rings it can tear, also requiring the drum to be reskinned. Owning a Drumdry drum cover or bag helps you avoid all these problems. The water-resistant cover or bag is packed with up to 1kg of silica gel moisture absorbent beads, ensuring the skin stays dry and increasing it's life. Giving you a tuned drum fresh out of the bag!